Today we’re sharing our final video from the 2016 Celebration of Harry Potter. This 37 minute video contains a wide variety of clips from the weekend. From opening night fireworks to more cast Q&A sessions you’re sure to find something you missed during the weekend! It also includes the preview for Harry Potter and the Cursed Child and Fantastic Beasts and Where to Find Them. Enjoy! Welcome to our longest video from A Celebration of Harry Potter. We recorded the full 40 minute cast Q&A panel for your viewing enjoyment. This panel took place on Saturday January 30th. Rupert Grint, Bonnie Wright, Matthew Lewis, Katie Leung and Evanna Lynch answered questions from fans attending the event. Welcome to the first of our post-Celebration of Harry Potter videos! To start off we have the press exclusive chat with Evanna Lynch, Rupert Grint, Matthew Lewis, Bonnie Wright and Katie Leung from Friday January 29th. In a few days we will be headed down to Florida for Universal Orlando’s 3rd annual Celebration of Harry Potter. We’ve gone every year and are excited to see what Universal has in store for fans this time around! Vacation packages are sold out, but admission to the event is included with any Park-to-Park admission ticket or Annual Pass. The schedule of events for A Celebration of Harry Potter can be found here. Here is what we are most looking forward to. We only listed 7 because that’s the most magical number, but be sure to share what you’re excited about! 1. Then amazing cast lineup! This year we get to spend some time, with Matt Lewis, Rupert Grint, Bonnie Write, Katie Leung and Evanna Lynch! They will be participating in two Q&A panels and also signing autographs and taking photos with fans who bought Premium Vacation Packages. 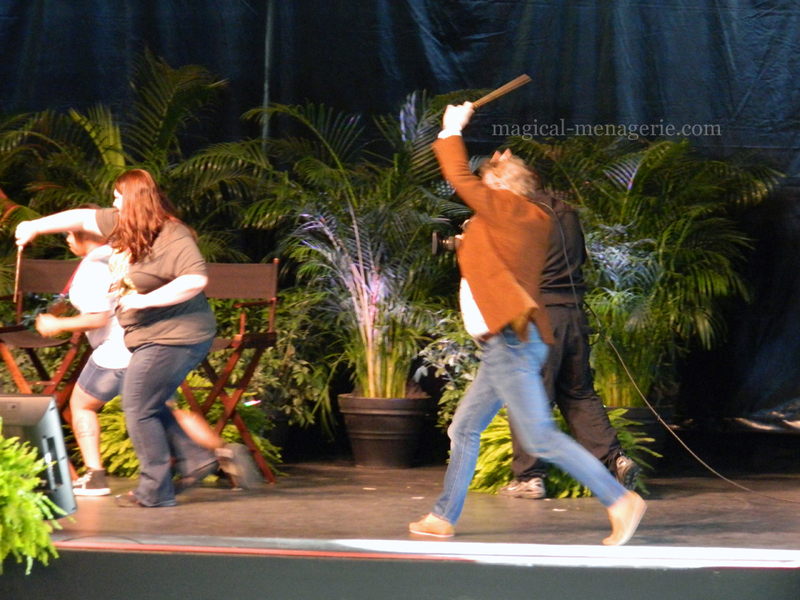 In the past the cast panels have brought some great conversations and amusing filming stories. 2. The Harry Potter Expo. The expo is always full of fun. This year there will be booths for Harry Potter™ The Exhibition, Pottermore, Scholastic, MinaLima and Warner Bros. Studio Tour London – The Making of Harry Potter™. 4. The Scavenger Hunt. This year Universal have set up a fun Harry Potter scavenger hunt that fans can participate in throughout the weekend! There are eight clues for you to find and take photos of/with. 5. Graphic Design for the Harry Potter Films with MinaLima! Our owner Megan is a graphic & web designer by day so seeing how the design team came up with the designs and props for the film is always a highlight! Who knows, we may even get some Fantastic Beasts tidbits! Fingers crossed! 6. Kids Beauxbatons and Durmstrang lessons. We may not be kids, but we can’t wait to see kids learn to dance Like a Beauxbatons student & battle Like a Durmstrang with a Universal Orlando choreographer. 7. Paul Harris’ Duelling Demonstration & Wand Masterclass. It’s always a blast learning how to duel with Paul, especially during the first year when Mark Williams demonstrated a battle sequence! Universal Orlando has released the schedule for their third annual Celebration of Harry Potter. Events for the Celebration will be taking place at both Islands of Adventure and Universal Studios. You can download the schedule and read more about the event here. 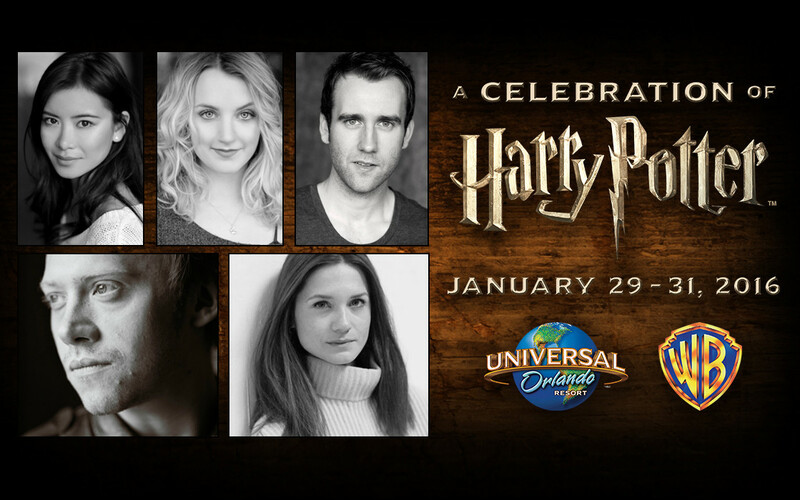 Universal Orlando Resort have announced the line up for the 2016 Celebration of Harry Potter! This year, which is the event’s third, will see some past guests as well as new ones that are sure to excite fans! Matthew Lewis and Evanna Lynch will all be returning to the event! Bonnie Wright, Rupert Grint and Katie Leung will also be joining in on the fun from January 29th – 31st. Access to “A Celebration of Harry Potter” is included with regular theme park admission or with an annual pass, with admission to certain activities being granted on a first-come, first-served basis. While most of the activities for “A Celebration of Harry Potter” will be open to all Universal Orlando park guests and will take place at both Islands of Adventure and Universal Studios Florida theme parks, guests who purchase the exclusive event vacation package will enjoy certain special benefits and reserved sections for the panels and demonstrations. Warner Bros. Studio Tour London offers visitors the chance to relive the magic through the eyes of the filmmakers who brought the Harry Potter film series to life. Visitors can step on to authentic sets and admire the real props and costumes used during filming at the series’ production home in England, UK. The Studio Tour is bringing an interactive taste of the experience to ‘A Celebration of Harry Potter’ 2016, giving you the chance to see the incredible behind-the-scenes talent that went into creating the iconic film series. Are you a Gryffindor or a Slytherin? A Hufflepuff or perhaps a Ravenclaw? At the beginning of each school year the Sorting Hat places new Hogwarts students into a house, and now you too have the opportunity to get sorted in a Great Hall setting inspired by the blockbuster films. Step inside the Expo and the red carpet is rolled out welcoming you to an area celebrating the global impact Harry Potter: The Exhibition has had during its 7-year, 13-city tour, including an exclusive Quidditch inspired photo opportunity. Graphic designers Miraphora Mina and Eduardo Lima worked for ten years on the Harry Potter films, creating countless unforgettable graphic props, some of which will be on display including iconic pieces such as The Marauder’s Map, Daily Prophet and Hogwarts school books. Since working on the films, they created the MinaLima Store selling authentic reproductions of the film artwork with limited edition art prints and stationery. They are currently in production on the new feature film from Warner Bros. Pictures, Fantastic Beasts and Where to Find Them. Pottermore is the digital heart of J.K. Rowling’s Wizarding World and if discovering more about her magical universe excites you, Pottermore has a surprise in store for fans attending this year’s Celebration of Harry Potter. And keep your eyes peeled for their new Pottermore Correspondent (Rita Skeeter she certainly isn’t), who’ll be there hunting out exclusive scoops and bringing you updates on pottermore.com from the weekend’s activities. Celebrate Harry Potter at Scholastic’s booth by sharing a message about what Harry Potter means to you. Color in a magical page from our brand-new Harry Potter coloring book. Be sure to enter daily raffles for a chance to win a copy of the new illustrated edition of Harry Potter and the Sorcerer’s Stone, a box set of all seven Harry Potter books, or a Harry Potter coloring book. Collectible giveaways are available for Harry Potter fans of all ages. Demonstrations and Q&A sessions will be available featuring Harry Potter film talent and crew, with special panels and demonstrations for kids. Admission into panels and demonstrations will be granted on a first-come, first-served basis. Specific times will be released at a later date. Ever wondered how long it takes to make a wand? Or where the inspiration for the hundreds of wand designs in the Harry Potter film series came from? Warner Bros. Studio Tour London presents head prop maker for the films, Pierre Bohanna, who will answer these questions and more. Once you’ve discovered how they were made, raise your own wand as Death Eaters invade the stage to demonstrate how battle scenes were brought to life. Join us in celebrating the touring attraction that’s visited 13 cities in 9 countries and hosted almost 4 million guests. Harry Potter: The Exhibition is in a unique position to reflect on the global impact of the franchise. Get an exclusive look at the exhibition’s creation and the excitement it continues to deliver to fans around the world. Panel will include exhibition creators, film producers, and film actors who have participated in the openings. Miraphora Mina and Eduardo Lima, from the graphic design studio MinaLima, will share insights into their role as graphic prop designers, and how their paths crossed at the WB film studios while working for 10 years on the Harry Potter movies. They will discuss and show some of the iconic props they created for the Harry Potter films, including The Marauder’s Map, the Daily Prophet, and The Quibbler, amongst others. Still immersed in all things Harry Potter, they will also talk about their involvement in The Wizarding World of Harry Potter – Diagon Alley, for which they designed all the street and store graphics. During the panel they will welcome questions from the audience. This year’s “A Celebration of Harry Potter” will also include kids’ demonstrations and interactive experiences such as a ‘Dance Like a Beauxbatons and Battle Like a Durmstrang’ experience, as well as Harry Potter film trivia.